There are a lot of products out there which claim to support the immune system - some are beneficial and some are just unsubstantiated hype - and most are expensive. So what should you do if you feel your horse needs some help to stave off winter stress or to make it less likely he'll catch what the horse down the road has? Clean water at a drinkable temperature. If you use automatic waterers, buckets or tanks should also be available. Every winter I hear from someone who's horse went without water for a day or longer because the auto waters froze up. Salt is often overlooked but is important to encourage adequate hydration. A 1000 lb horse should receive an ounce of salt (about 4 teaspoons/day) year round. Inadequate sodium (from salt) can lead to dehydration at a "cellular" level which can impede or obstruct normal cellular metabolism. Plain white table salt is best. "Designer" salts make attractive door stops but may contain high levels of undesirable minerals. If your supplement contains less that the minimum requirement for iodine (most only contain 2 mg) use iodized salt which contains about 1.7 mg iodine per ounce. If you feed mainly Bermuda hay and your horse doesn't seem to be looking/feeling his best, consider replacing some of the hay (up to half) with Timothy pellets. The added cost can pay off in improved condition and good health. Avoid feeds with high levels of simple sugars and starch (which converts to glucose) as excessive glucose can support inflammation. The processing of "senior" feeds does help greatly with improving digestibility but some contain excessive starch. Look for high fiber feeds as these will be more apt to promote good gut health. Or give your senior horse a 50/50 combination of beet pulp and steamed or crimped oats plus hay and/or Timothy pellets, along with a quality supplement, for a nutritious senior diet. Avoid feeds and supplements with "added" iron. Excess iron can help fuel inflammation and many forages already supply excessive levels of iron. Vitamin E and Omega-3 are important antioxidants which decline rapidly when hay is cut and cured. For best immune support, provide vitamin E at a rate of 1000 IU per 500 lbs of body weight (2,000 IU for a 1,000 lb horse). 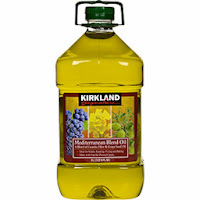 It doesn't matter if the vitamin E is synthetic or natural but it does need fat for absorption. Using human gel caps which also contain oil is best, otherwise add a small amount of oil at feeding time. For an inexpensive oil which also adds a small benefit from medium chained triglycerides, try Costco's Mediterranean Blend (canola, olive and grape seed oils). The simplest and most cost effective source for Omega-3 is flax. Provide about 2 ounces/day of fresh ground flax seed (which can be pre-ground and stored in the refrigerator) or stabilized flax - HorseTech NutraFlax, Omega HorseShine or Triple Crown OmegaMAX. Iodine and selenium are both important for adequate thyroid functioning. If your supplement has inadequate iodine, use iodized salt or the original Source meal which has a guaranteed level of iodine. If using another kelp or seaweed product, check that the iodine level is guaranteed. Most supplements include selenium at about 2 mg per serving (2 mg per day). If blood tests show low selenium levels, you may need to use a selenium yeast product such as Platinum Selenium Yeast at a higher than usual dosage to bring the level up. I feel using an oral selenium yeast algorithm is safer than selenium injectables. Vitamin A - around 15,000 IU/day. Vitamin A losses in hay occur over time; if hay is over six months since cutting it should be supplemented. Many supplements provide this or you can use human gel caps. Vitamin D - horses are able to synthesize their own vitamin D and it is also stored in the liver, usually in quantities sufficient to carry most horses through the winter. If supplementing, stay close to the minimum requirement (3,000 IU for a 1000 lb horse) as excessive D can be toxic. Again, if not provided in your supplement you can add human gel caps. Glutamine - this is an amino acid which is being added more frequently to equine probiotics. It has been shown to be protective for the mucous membrane lining of the intestines which may help support the intestinal flora production of some immune modulators. There has been more research lately showing the importance of the intestinal lining and intestinal flora in maintaining immunity. Cost to provide glutamine is about $0.44 for 10 grams per day. See the links below. B-vitamins - not likely deficient except in stressed horses or those with gut issues. May be included in supplements or can try a human "multi-B" tablet. Adding yeast (Saccharomyces cerevisiae - Diamond V or Yea Sac) can help provide a substrate for intestinal flora, which synthesize the B vitamins, to thrive. I'd certainly consider these basic and cost effective additions to my horse's diet before moving on to more exotic - and pricey - immune support therapies. The thermometer showed 42°F this morning - chilly for those of us used to the sunny warmth of Southern Arizona but just right for our horses. Horses thrive in “thermo neutral” temperatures ranging from 40 or 45°F to 65°F. Above 65, they begin to rely on sweating, with water and salt loss, for cooling. Under 45 they use energy to maintain their body temperature. According to Dr. Robert A. Mowrey, Extension Horse Specialist at North Carolina State University, the standard “critical temperature” is 45°F, with 10 degrees subtracted for wind and another 10 degrees subtracted for rain/wet coats becoming the “actual” temperature. On a 45 degree day, if the horse is wet and unprotected from wind the “actual” temperature is 25 degrees - which is cold. For each degree below the critical temperature the horse requires a 1% increase in calories to maintain a constant temperature. At 25°F a horse needs 20% more calories than when the temperature is a neutral 45 degrees. That’s 20% more calories, not 20% more forage - how that translates to hay or beet pulp depends on the DE (digestible energy in Mcal per pound) of the forage. For grass hay with a DE of 0.8 Mcal/lb that would mean an additional 1.2 pounds of hay, with alfalfa hay or beet pulp at about 1.2 Mcal/lb, he would need less than a pound of additional forage. The calorie increase should come from forage - preferably long stem grass or alfalfa hay, but cubes, pellets or beet pulp also work. This is because the greatest amount of immediate heat maintaining energy is produced by the fermentation of forage in the hind gut. While additional calories from grain will help retain body weight, grain doesn’t provide the heat-producing fermentation that forage does. The Cold Weather Feeding Chart and Calculator on my web site can help you determine how much additional forage is needed for your winter temperatures. The Chart in the pdf file is set for a 1000 lb horse; you can use a percentage of the recommendation if your horse weighs more or less. Or, if you’re comfortable with spreadsheets, you can download the Excel version (opens with Excel, Numbers or Open Office Calc) and plug in your horse’s weight and the DE of your hay. These are starting points - your easy keeper may need less and your hard keeper may need the more concentrated calories from alfalfa or beet pulp. And if your horse is a senior or is IR/PPID and prone to laminitis in the winter, don’t forget the boots and leg warmers. Do use a cooler until your horse is dry after work but think twice about blanketing a horse with a full winter coat - no matter how cold it feels to us your horse can easily become overheated and start sweating under a winter blanket. The Horse Report, published by UCDavis Center for Equine Health, has always been one of my “go to” references. 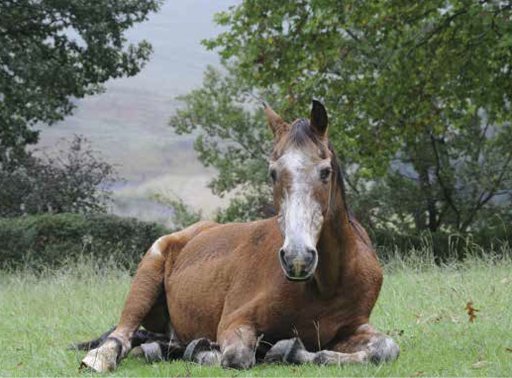 The latest issue of the Horse Report, "Caring for Horses Through Life and Death" is now available on the Center for Equine Health’s web site both as a downloadable pdf or in Zmag format. This is an especially insightful look at preparing for our horse’s end of life and includes some deeply moving perspectives from the Center’s veterinarians. To be read now for information on some of the practical aspects of euthanasia, this issue is also a keeper - to be downloaded and saved, and perhaps printed and filed with our horse's other important papers, so it is available when we might need it. Those of us privileged to have these creatures share their lives with us also know that they will leave - often way too soon. How is this equine nutrition related? The donkeys at Forever Home are all on on mineral balanced donkey appropriate diets. Many of these rescues are unadoptable because of hoof problems, chronic medical issues, or other problems related to abuse as roping donkeys. But they all have an opportunity to regain their health and live out their lives in peace in a protected sanctuary. 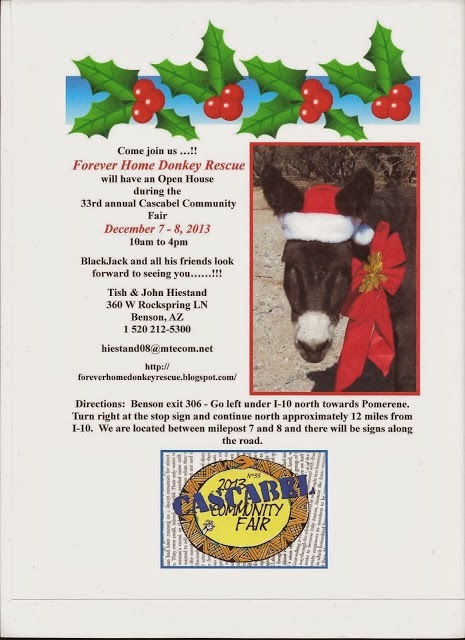 If you're in the neighborhood, stop in to meet these delightful creatures and have some community fun in Cascabel. This makes a wonderful day trip from Tucson or Phoenix! 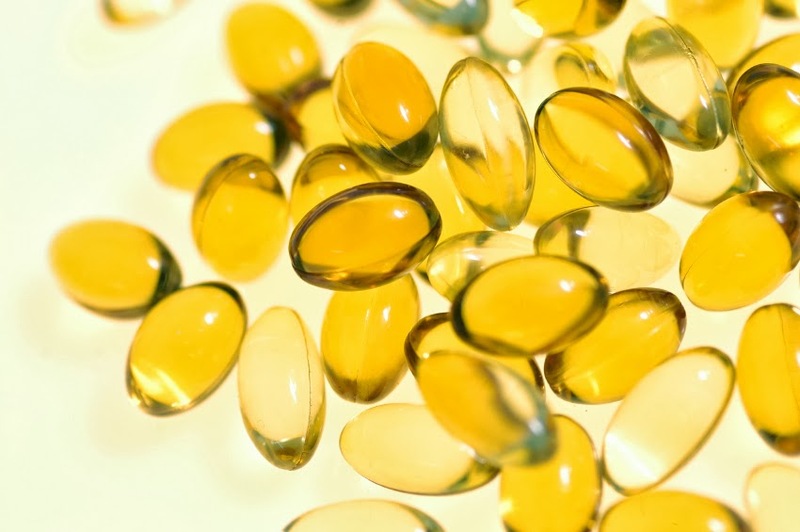 I just updated my web article on comparing Vitamin E costs, including links to sources and more information to help clarify forms and types of vitamin E. I hope you will find the article helpful as this is always a challenging topic. It's time to reactivate the Desert Equine Balance Group on Google Groups. The group is focused on Equine Nutrition in the Southwest and related discussions - especially those pertaining to the differences we often see in some area hays (Arizona, California, Colorado, Nevada, New Mexico, West Texas and other arid areas) as they pertain to all horses - not just those who are insulin resistant or have Cushing's disease. Changes in weather patterns, growing practices, increased costs of production and shipping and an expanding export market are affecting the availability and quality of forage for our horses and have, in some instances, caused problems for horse owners. Because of these changes and the scarcity of reliable information, together with the ever increasing knowledge level of horse owners, this seemed like the right time to have these discussions. More and more horseowners are taking nutrition courses, testing their hay and evaluating the results either on their own or with the help of an independent equine nutritionist - vets and feed manufacturers are responding! Horse owners are no longer willing to accept what's printed the label as gospel without seeing the data to back up claims. Many have committed more hours to equine nutrition education that their veterinarians received in vet school - but to be fair, do we really expect our vets to be the ultimate authority on everything in this age of specialization? Savvy consumers understand that "controlled starch" may contain well over an acceptable amount for their Insulin Resistant (IR) horse or pony and that the research about the effect of nitrates on horses is practically non-existant. If you're already a member of the Desert Equine Balance Group, feel free to jump in with your questions and experiences. Try to keep things focused on nutrition and no advertising thank you. Looking forward to your equine nutrition questions, experiences and answers! Labels: Analyzing hay, Balancing hay, Desert Equine Balance, Feed Problems, Questions and Comments? NO Laminitis! 2013 Conference - It's a Wrap! Awesome conference, lots of new information. Some of the best part for me was watching the wonderful expressions as people saw and heard the latest thinking and research. her amazing horse Fari on the banner. Sarah Braithwaite of Forageplus in the UK joined us this year. 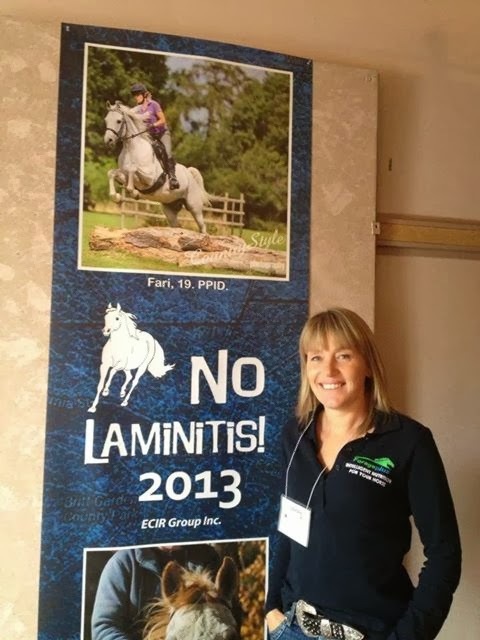 Sarah is one of those people who lights up the room when she enters and she has been a driving force in advancing balanced nutrition and laminitis prevention in the UK. The Primary focus of the No Laminitis Conference is to prevent laminitis through disseminating information that can help metabolic and endocrinopathic horses. ECIR is committed to providing high-quality information, with scientific backing and real-life experience. For a great summary of facts, signs and symptoms and diagnosing Insulin Resistance (IR) and Cushing's disease (PPID) see Sarah's latest news update. Did I hear hints of a NO Laminitis! UK conference happening next year? Many thanks to all the organizers, volunteers and helpers at the conference, and especially to those who kept the home fires burning at the ECIR online group to make sure no new members needing help were left behind over the weekend. The conference attendees were wonderful - it's these folks who will be carrying on the grass roots and "boots on the ground" traditions begun on ECIR by founder Robin Siskel and Elenor Kellon, VMD, supported by science-verified information. More photos on the ECIR Facebook page plus watch for information on when and where the conference proceedings will be available. And keep an eye on NO Laminitis! for information on the next conference. Iodine - Too Much or Not Enough? In the latest issue of a well known equine publication, an article on thyroid dysfunction suggests that "...most equine diets of hay and pasture grass (other than in the Pacific Northwest) contain far more than the daily required level of iodine...", and, in a sidebar, cautions that supplementation of iodine could worsen a suspected thyroid issue. Also overlooked here is the small but important role selenium plays in thyroid function. Let's look at some of the facts about iodine. The National Research Council (NRC), based on the best evidence availablle, suggests a dietary requirement of iodine for horses as a range and recommends using the average of that range as a minimum target. This can also be expressed as a weight-based requirement, presuming the horse has a daily feed intake at 2% of its body weight (BW), which works out similar to the above average. The maximum tolerable level for iodine has been set at 5 mg I/kg DM, or 45.5 mg for a 1,000 lb (455 kg) horse. In a few instances (AZ horses on CAP water, high nitrates in hay, which I now always check in Southwestern hays and other grass hays with high protein levels) I will double the NRC recommendation but otherwise stick with the mid to high range. From NRC - "Iodine toxicity [seen as goiter] usually results only when iodine is oversupplemented or when animals are receiving feeds containing unusually high amounts of iodine such as some types of seaweed." but toxicity in mares receiving as little as 40 mg a day has been reported. Iodine concentrations in most common feedstuffs range from 0 to 2 mg/kg DM (equivalent to 0 to 18 mg in 20 lbs or 9.1 kg of hay) depending on the iodine concentration in the soil in which they are grown. As with other minerals, many conditions can affect forage uptake of iodine from the soil and different farming practices may deplete or concentrate available levels. Depending on free-choice intake of iodized salt to supply iodine requirements has been shown to result in iodine deficiency in pregnant mares resulting in leg abnormalities in foals, and even when iodized salt is directly added to the feed, the amount may not meed NRC requirements. Without going overboard, ensuring an Iodine intake level equal to the standard NRC recommendation of 0.35 ppm up to the "high" range of 0.6 ppm might also provide insurance against uptake of the [very] low levels of I-131 detected by Environmental Protection Agency (EPA) monitoring and other environmental "insults". It is unlikely that using even the higher suggested range would tip your horse over the maximum tolerable level even if your forage contains a fairly high level of iodine. But we should also keep in mind that there is little direct equine research on iodine; without this it's difficult to consider levels higher than those which have been documented to cause goiter in studied horses - 5 mg I/kg DM, or 45.5 mg for a 1,000 lb (455 kg) horse. Iodine testing for hay and forage is not readily available at most forage labs in the US; when it is the cost may be prohibitive. For example, at Cumberland Valley Analytical Lab, the price for their Iodine test is $75. On the other hand, if your horse is experiencing issues you feel may be related to excessive iodine intake, the cost may be a worthwhile investment. Total serum iodine and particularly serum inorganic iodine reflect the current dietary iodine consumption. Serum inorganic iodine is a good short-term measure of iodine consumption and will reflect excessive iodine supplementation, when present. Often overlooked when considering possible thyroid dysfunction is selenium deficiency - selenium is necessary for conversion of the inactive hormone T4 to the active thyroid hormone T3 and selenium deficiency together with high iodine intake may result in low T4 levels and other thyroid issues. http://www.ncbi.nlm.nih.gov/pubmed/9187638 Selenium level testing in whole blood in horses is readily available and also easily included in forage testing (generally under $40). In summary, iodine is but one element of an overall mineral balanced equine diet. As with any other mineral or supplement, targeting just one nutrient without taking into account how all nutrients interact with one another is not likely to produce the desired results. Don't throw away the iodized salt or iodine supplement but do make sure that protein, calories, major minerals and other trace minerals are balanced and appropriate for the horse's age, weight, work and reproductive status. Check that any kelp or seaweed products you use contain guaranteed levels of iodine. "Sea salt", despite the reassuring name, often contains only minute traces of iodine and can't be relied on as an iodine source. The next time your vet draws blood consider having her check a selenium level - especially if it's been suggested to add a "thyroid" supplement. It makes little sense to use a drug to correct a basic trace mineral deficiency - adding the NRC recommended levels of iodine and selenium may help normalize thyroid function test results. Nutrient Requirements of Horses, Sixth Revised Edition (NRC 2007) Pages 91-92. Many horse owners are unsure if AZ Copper Complete with chromium is right for their horse. This has been a popular supplement to use when hay can't be tested for more precise balancing or in boarding situations. Developing this mix was done with the insulin resistant (IR) horse in mind on a diet of mainly Southwestern hay which is likely deficient in chromium. Because chromium can provide antioxidant support, providing this mineral in small amounts can also be appropriate for horses which aren't IR, or consume hay or pasture in other regions of the country. But there are some circumstances where we might not want to add chromium to the diet. Horses with PSSM/EPSM can be insulin "sensitive" rather than insulin resistant, so we may want to avoid ingredients such as chromium which can improve insulin sensitivity. Soil in many parts of the US are not chromium deficient and some may have high levels as a result of "industrial fallout". As I've had many requests about the availability of AZ Copper Complete without added chromium, I checked with Rod Johnson at HorseTech, where AZ CC is manufactured and sold. I am happy to announce that you can now purchase AZ Copper Complete without chromium! As most of you know, this supplement has always been available only directly from HorseTech, with no "middle man" or reseller charges, and I receive no remuneration from the sale of AZ CC. This ensures HorseTech is able to keep the supplement available at the most reasonable cost to you and that the product you receive is at its freshest. And, like everything they sell, it is covered by HorseTech's 100% satisfaction guarantee. To order AZ Copper Complete without chromium, call HorseTech at 1-800-831-3309 or send an email to Service@HorseTech.com and request AZ Copper Complete without chromium. The supplement will have a different "MS" number on the label; if demand is high enough then it can be added to their Popular Custom Products order page. You can still order AZ Copper Complete with chromium at the Popular Custom Products order page as you alway have. You can find out more about AZ Copper Complete here and view or download the label and a spec sheet. If you have questions about including AZ Copper Complete, a custom supplement mix or another HorseTech product in your horse's diet, you can email me at desertequinebalance@gmail.com. What does it take to go one hundred miles in twenty four hours or less, with temperatures above 100 - and then be judged "fit to continue"? Dedication, training, conditioning, good hoof care and a great foundation diet! The top endurance horses in the U.S. go on and on. We see them year after year - healthy, sound whether barefoot and booted or shod, with lots of reserve. What they were fed three or six months ago can make the difference between winning the Tevis or Haggin cups or not making those tough last few miles. Congratulations to Take A Break and rider Rusty Toth on their first place Tevis win. Haggin cup winner Julioslastchance, ridden by Suzanne Hedgecock, was deemed the Top Ten horse "in the most superior physical condition" following the race. Watch these two amazing horses in action and consider what the right diet, great hoof care and a consistent conditioning program could do for your horse. In case you missed the live interview with Dr. Eleanor Kellon and ECIR Group Inc president Dr. Jaini Clougher, go to http://traffic.libsyn.com/jpr/The_Jefferson_Exchange_06_10_2013_Hour_1A.mp3 to listen to the archived interview. Jefferson Public Radio covers the Oregon and Northern California area including Jacksonville, where the NO Laminitis! 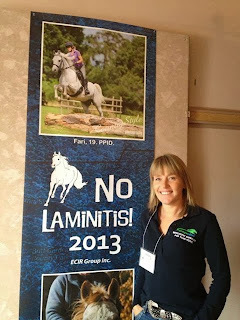 2013 conference - featuring Eleanor Kellon, VMD and Hoof Physiologist Robert Bowker, VMD, Phd - will be held in September. The Oregon Veterinary Examining Board has approved the conference program for 13 Continuing Education credits - a great opportunity for your vet or other equine professional to enjoy an informative weekend in a beautiful area. Lots of points of interest for other members of the family, and a short trip to some of the major BLM Mustang Herd Management areas. Lots more information at http://www.nolaminitis.org. 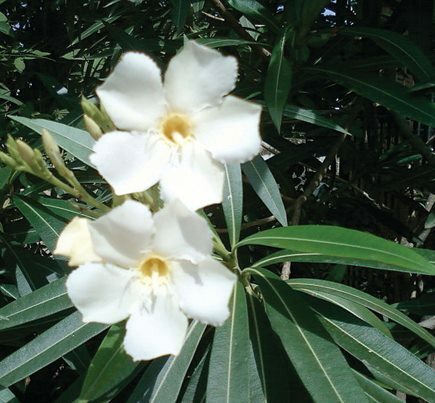 Cardiac glycosides, the primary toxins in oleander, can cause an irregular or erratic heart rate, which may be racing initially, later slowing to below normal. Kidney failure, colic and CNS symptoms from drowsiness to seizures and collapse may occur. In the Southwest, Oleander is everywhere. Its evergreen foliage and beautiful flowers make it an attractive landscape plant, used extensively in new housing developments and along roadways. But its beauty hides a deadly danger - just four oleander leaves can kill an adult horse. Dry leaves that blow into your horse’s paddock are as deadly as those on the plant. Unsuspecting newcomers to the area may have oleander planted in close proximity to their horses - or your new neighbors may have planted an oleander hedge right next to your horses' turnout fence line. If this is the case, you may have to resort to offering to pay for and help plant a safer replacement. This may be much less expensive in the long run than the potential veterinary bill and can keep you on better terms with your neighbors - they likely were simply unaware that these plants could harm your horses. Any plants that are removed should be bagged and taken off the property as soon as possible as the dried leaves are as toxic as the live plant. 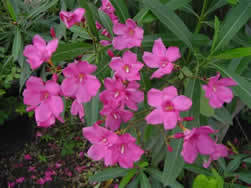 Toxicity can also occur from inhaling smoke from burning oleander leaves and wood. One of the most complete listings of poisonous plants is the Cornell University Poisonous Plants Informational Database which lists plants by both common name and scientific name. Another excellent resource is A Guide to Plant Poisoning of Animals in North America from IVIS (International Veterinary Information Service), which lists plants by systems affected - very helpful if your horse is showing symptoms and you and your vet are trying to determine a possible cause. Accessing IVIS does require registration (which is free). If you’re uncertain of your skill at identifying plants you can consult with your state’s local Cooperative Extension agent to walk your land with you to identify potential problem plants. - where I hope to see everyone keep their horses safe. Each U.S. state and territory has a state office at its land-grant university and a network of local or regional offices. These offices are staffed by one or more experts who provide useful, practical, and research-based information to agricultural producers, small business owners, youth, consumers, and others in rural areas and communities of all sizes. Iodine and selenium, though needed in only small amounts, can make a profound difference in how the thyroid gland influences our horse's health. In this article from Holistic Horse, equine nutritionist Eleanor Kellon, VMD, explains the importance of thyroid hormones. Most of the body's iodine is concentrated in the thyroid gland and deficiencies clearly influence thyroid function. Excesses are also harmful. Selenium is required by the deiodinase enzymes and by the glutathione antioxidant that protects those enzymes. 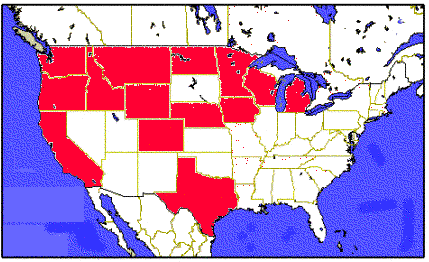 Both iodine and selenium are deficient at baseline in many areas of the country. How do you know if your horse is getting enough of these important minerals? The average horse requires from 2.5 to 3.8 mg of iodine per day for maintenance, and from 3.3 to 5 mg per day when in work. Iodized salt provides an average of 1.7 mg iodine per ounce, so the average horse would need to take in one and a half to three ounces of iodized salt per day to obtain the correct amount of iodine. Many supplements provide less than 1 mg iodine per serving while some provide up to 5 mg. If using kelp or seaweed to provide iodine, make certain the iodine level is guaranteed with both a minimum and maximum - not just a minimum. While we generally rely on USGS maps to see if a geographical area has high or low levels of selenium, this mineral can occur in pockets or accumulate in low lying drainage area. Modern farming practices may have also altered the "native" mineral composition of the soil. Your hay grower may know, but your best bet is to include a selenium level when testing your hay. If you suspect selenium related issues (continued low thyroid levels despite adequate iodine, tying up or weakness or short striding behind) ask your veterinarian to run a whole blood selenium level on your horse, usually done together with a vitamin E level. These "micro" minerals, despite the small amounts required, can have a major influence on your horse's health and well being. Reminder - the FREE online nutrition course from the University of Edinburgh has just begun! You still can sign up for the course and download the first week's slides and videos. The program will last five weeks, there are quizzes and a Statement of Accomplishment signed by the instructor as a completion certificate. where it is cold and windy - what??? I'm frequently asked "what do you think of [fill in the blank] feed? Is it safe for my horse? Is it a good feed? Should I use it instead of [fill in the blank]. How does it compare to [fill in the blank]? Will it work with my hay? If eliminating obesity were merely a matter of cutting calories, you could simply cut a horse’s rations in half and expect great results. But that’s not the case. On the contrary, as any horse owner can tell you, watching a horse go hungry is heartbreaking. In addition, starving a horse can set off a chain of events that harm more than help, i.e., loss of muscle mass, nutrient deficiencies, etc. My personal preference is to use "straights" - hay and single forage or fiber products such as hay pellets, beet pulp, soy hulls, etc., add hard grains and protein supplements where needed and supplement minerals based on the results of forage analysis. 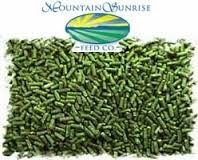 But there are circumstances where pre-mixed bagged feeds are useful - not only for convenience but because a quality product can enhance the forage-based ration. No matter what the label, web site or advertising says, pre-mixed bagged feed will rarely even come close to balancing your forage. Most pre-mixed feeds are "balanced to itself" - the minerals are in minimum amounts and ratios per NRC guidelines when fed as directed but, as there is no way of knowing the mineral content of your forage without testing, the feed might complement your forage or it may exaggerate an existing imbalance. This is especially true when looking at "hay balancers" that are designated for "alfalfa" or "grass" hay. As a rule, the calcium level in alfalfa hay is high, while many grass hays have lower levels of calcium. While the alfalfa hay generally requires added phosphorus to balance the high calcium, the grass hays often have excellent calcium to phosphorus ratios (between 1.5 to 2:1). While the calcium level may be low compared to alfalfa, the grass hays often provide adequate calcium for most horses and adding more by using a "grass" balancer will now create a new imbalance. Two primary reasons for using pre-mix feeds are convenience and lack of knowledge. I've succumbed to the convenience factor when job demands limit my time - when rushed I will substitute a pound or so of TC 30% (yummy but low sugar/low starch high protein) added to some Timothy pellets for the beet pulp/Timothy pellet/custom supplement mash I usually feed every day. Convenience is also a factor for many boarders, feeding a large number of horses or when the horse owner is away from home and wants to simplify feeding for the caretaker. Education can be an eye opener for people used to feeding out of a bag when they realize how much they've been paying for unnecessary nutrients and, possibly, still not covering deficiencies. With a little effort and knowledge, "straights" can often be used at considerable cost savings while providing a more complete "customized" ration for your horse. Feed labels have lots of information - some of it is important, some of it is irrelevant and much of it is confusing. The first part to consider is the feeding directions. Most feeds are formulated to be fed at specific rates - usually "pounds of feed" per "pounds of body weight". If you are relying on a feed to provide minerals and vitamins then you need to feed at the rate the label directs. One piece of information missing from US equine feed labels is DE - digestible energy, which is shown on our hay analyses as "Mcal". If you feed less than the rate shown in the directions, your horse will not get the expected level of nutrients. I use copper as a quick check for feeding rates - most "average" sized horses need a minimum of 90-125 mg of copper per day. As most hay and other forage contains low levels of copper, I rely on supplemental copper to provide at least the minimum requirement. The label usually shows copper as "ppm" - that is "mg of copper per kg of feed". To see how much copper is in a pound of feed, divide the ppm by 2.2. 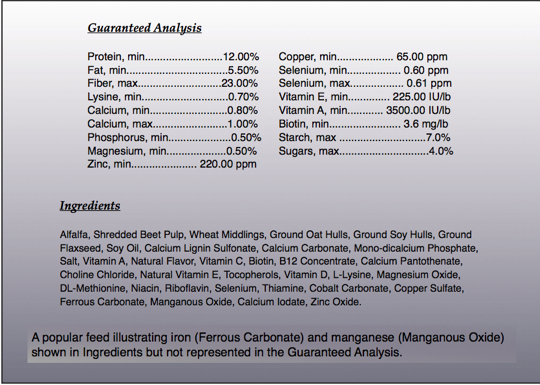 If the feed label shows "copper 65ppm", then it contains 29.5mg per pound, or 118mg in four pounds of feed. This will likely be close to the feed rate shown in the directions. But feeding at the "as directed" levels can also have problems. Some labels will say something to the effect of "feed as directed in the table below and adjust to maintain condition". While this may work for an experienced horse person who has a good eye for what constitutes "condition", this can baffle the inexperienced owner who has no idea what an endurance-fit Arab might look like compared to a show ready Warm Blood or a working Quarter Horse, or if a horse is showing signs of a specific nutritional deficiency. Cutting back the amount fed can result in inadequate nutrition (yes, a fat horse can be "mal-nourished") while feeding more to encourage weight gain can result in giving excess minerals and vitamins. To keep within the correct feeding range, you can reduce the amount of forage or pasture but need to make sure the horse is still receiving adequate fiber - at least 1.5% of its body weight in hay or (the dry weight of) pasture. Ideally, we should feed based on the DE (energy in Mcal) of the feed. If you have the feed analyzed the report will contain this information; a few manufacturers will provide DE when requested. (When the DE is known, I will be adding it to future feed comparison tables.) If the DE was readily available, it would help you to easily choose feeds that fit your requirements. Switching to a highly fortified feed which is fed in small amounts may help when more protein and major minerals are needed in a smaller energy base. These are concentrated feeds, often high protein, which are usually fed at a rate of 1-3 pounds per day - more than a "supplement" but less than a "feed". Some comparisons are shown here. Supplemental feeds are meant to be fed along with hay and have lower protein levels than the highly fortified feeds. They may be grain based for performance horses or high fiber for "special needs" horses and may contain fairly high levels of fat for "alternative energy sources". Feeding rates may range from five to ten or more pounds/day. The fad for high fat feeds seems to be waning but there is still a lot of emphasis on adding fats for "cool" calories. Some supplemental feeds contain enough fiber to bridge into the "complete" feed category. Complete feeds are formulated with higher levels of fiber and can replace all or most of the ration. Fiber sources range from beet pulp to hay to soy hulls and other by products. Fat levels can vary from "normal" (around 3%) to high (6% or more). They are meant to be easy to digest - an advantage for aged horses; many "senior" feeds are complete feeds. These are fed at fairly high rates beginning at about ten pounds per day for an "average" sized horse depending on how much, if any hay is included in the diet. Forage feeds fit in a new category emerging that combines the simplicity and nutrition of "straights" along with the convenience of bagged feeds. Plain grass hay pellets and bagged cubes are gaining popularity as both the main forage foundation or to provide variety from the primary hay fed. Many horses do well on a diet of 100% plain hay pellets coupled with a flax-based supplement and some salt. Minerals are added to hay chop or cubes to provide a complete bagged forage that can be used as the total diet. These forages are also useful to round out a marginal hay. Forage feeds can provide consistency when traveling and feeding local hays. If you choose to use a pre-mix bagged feed, whether for convenience or you're not yet confident enough to build your horse's ration from bottom up, make sure you've covered the basics. Have a good idea of why you're feeding the pre-mixed feed and specifically what gaps you want to fill in. For example "growth" is not a good criterion but "my local hay has been tested by the extension office and is consistently low in protein and calcium" is a good basis for looking for a feed with added protein and calcium for your weanlings. If you need a low sugar/low starch feed, don't rely on the name - "Safe" often isn't. Look for sugar plus starch guaranteed at less than 10% for an actively laminitic or symptomatic Insulin Resistant horse. Compare labels - some "specialty" feeds are merely new labels. Quality control costs money - a product that is tested before, during and after manufacture will cost more. Few feeds provide adequate levels of salt. Make sure your horse is receiving at least one ounce per day and have additional plain salt available at all times. Monitor your horse's water intake. If you use automatic waterers, know how to check your horse for dehydration. Understand what's fat, thin and "fit". A race-fit Thoroughbred or Arab will look emaciated by halter horse standards while a "rounded" dressage horse or eventer may appear fat to an endurance rider's eyes. Use a weight tape and learn to visualize the difference between fat and muscle, a normal reserve of fat and the excessive fat pads of the obese horse. We're all responsible for what goes into our horses, whether we carry the feed bucket or someone does it for us but you don't need to become an equine nutrition "expert" to understand the importance of what and how we feed our horses and to become a knowledgable advocate for your horse.